World football's governing body is engulfed in a corruption crisis, including an investigation into the award of the 2018 World Cup to Russia. Yet Putin is a big fan of the under-fire Blatter, 79. "People like Mr Blatter or the heads of big international sporting federations, or the Olympic Games, deserve special recognition," he said. "If there is anyone who deserves the Nobel Prize, it's those people." Blatter announced he would be stepping down on 2 June following the arrest of seven Fifa officials as part of an investigation that saw 14 people indicted on corruption charges. Blatter has said he has a "clear conscience" and is planning to remain in office until Fifa holds an extraordinary congress to elect his successor next February. 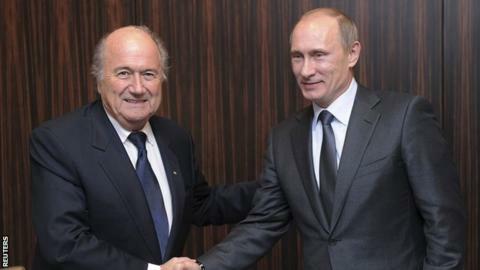 "We all know the situation developing around Mr Blatter right now," added Putin in an interview with Swiss television. "I don't want to go into details. but I don't believe a word about him being involved in corruption personally."